Russian Ambassador to the United Kingdom remembers the most significant connections between two countries before the Russian-British Year of Culture. The governments of Russia and Britain have designated the year 2014 as Russian-British Year of Culture. More than 250 cultural events are expected to take place in the first project on that scale in our bilateral relations. However, we are not starting from scratch. British culture has always been welcome in Russia (favourites include Shakespeare, The Beatles, the architect Charles Cameron, the artists James Whistler and George Dawe), but Russian culture has also been popular for centuries in Britain. There is plenty of evidence that our cultural relationship has always had strong elements of interaction and mutual influence. 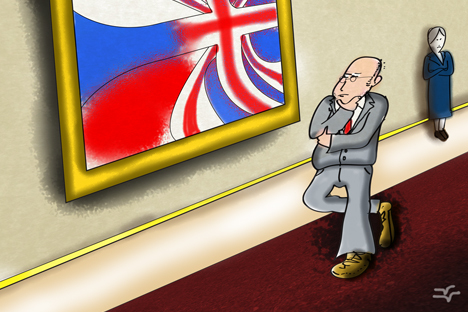 The history of Russian-British ties goes back at least 460 years. Throughout this time, Russian culture was a very obvious phenomenon in the British Isles. Despite the fact that our political relationship has had its ups and downs, the cultural fascination with each other has always helped us to keep in touch. England first became acquainted with Russian culture in the 16th century, when the embassy of Tsar Ivan IV arrived in London. References to Russia can be found in Shakespeare’s plays, including Love’s Labour’s Lost as well as in Virginia Woolf’s novel Orlando. In the 18th and 19th centuries, many influential Russian cultural figures such as Princess Ekaterina Dashkova, the historian Nikolai Karamzin, writers Ivan Goncharov, Ivan Turgenev, Fyodor Dostoevsky and many others visited Britain, along with Alexander Herzen, who lived here in exile. It is around that time that William Shakespeare became as much a cult figure in Russia as Anton Chekhov became in Britain in the 20th century. The Russian cultural presence became more prominent in the period of Russian-British alliances during the Napoleonic wars. Some buildings and monuments in Britain today reflect that influence, notably the sculpture of a Russian eagle on a double column in Bayswater Road in London, the nearby Apsley House and Windsor Castle. After the strain of the unnecessary Crimean War of 1853-1856 and the terms of the Peace of Paris, Russia and Britain rediscovered each other during the allied relationship before and during the First World War. It went far beyond a joint struggle for peace in Europe. This was a time of great cultural exchanges: for example, a mission of prominent Russian public figures, writers and journalists – including the writer Aleksey Tolstoy, Vladimir Nabokov (the father of the novelist), and the children’s poet Korney Chukovsky – visited Britain in 1916. A similar British mission was sent to Russia. It was a genuine breakthrough in the relationship encouraged by the two governments, and it was a time when the people of Russia and Britain looked beyond the stereotypes. During the Second World War the Arctic Convoys served as a living link between the two countries and helped bring the two peoples closer through effective comradeship-in-arms. There are other examples of lasting cultural ties. Many Russian scientists and artists were awarded the title of honorary doctor at Oxford University. The history of Cambridge University is closely associated with the name of the physicist Pyotr Kapitsa. One of the most memorable 20th-century events in Britain was the visit of the first cosmonaut Yuri Gagarin in 1961. There is also a strong Russian connection in British sport. One of the most famous British rugby players was Oxford’s England international Count Alexander Obolensky (1916-1940). British ballet is still greatly influenced by Anna Pavlova and Tamara Karsavina. One of the important sources of cultural influence in Britain today is the Russian community. Its members have established a number of organisations promoting Russian culture and language and play an important role in the multicultural fabric of British society. The London office of the Russian Federal Agency Rossotrudnichestvo has become a popular place for people in love with the country’s culture. Regular cultural exchanges continue: the Bolshoi and Mariinsky theatres, a huge number of different theatrical companies, exhibitions, singers, musicians, artists and many others are frequent guests in the United Kingdom. The Year of Culture in 2014 will build on this tradition, contributing to the growing sense of affinity between our nations.